The 30-in. deck on the new, wide-area Toro TurfMaster walk-behind mower features a precisely timed, twin-blade cutting system and a three-in-one design for mulching, bagging or side-discharge. The deck is constructed of 13-gauge steel and is outfitted with a strong bullnose front bumper, skid plates on the bottom of the deck, plus a metal rear door. For additional durability, the mower has a cast aluminum frame, a thick, one-piece handle, as well as brush guards and an engine guard to protect components from damage. 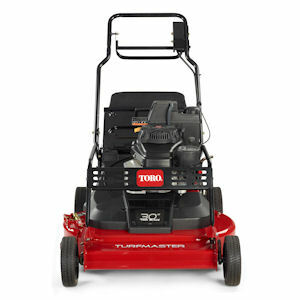 With the Toro two-point height-of-cut system, the operator can make adjustments from 1.5 to 5 in. in 0.5-in. increments. The mower also features a 1-gal. fuel tank, a single bail control system for easy operation, and a blade brake clutch so the operator can disengage the blades without shutting off the engine. Powered by a commercial-grade Kawasaki FJ180V gas engine with a spin-on oil filter, the TurfMaster has a rear-wheel drive transmission with variable ground speeds up to 4.1 mph. It offers a one-year limited commercial-use warranty and a two-year limited commercial-use engine warranty.